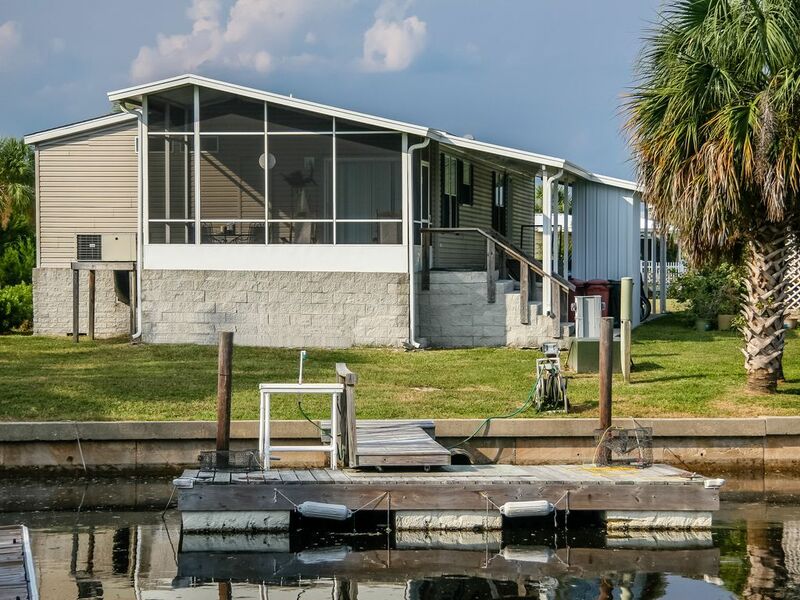 Only minutes away from world-class speckled trout fishing waters, our 3-bedroom vacation home is located on the Apalachee Bay in Shell Point, Florida (30 miles south of Tallahassee). This 1492 sq. ft. modular home is located in gated Paradise Village of Shell Point, with a community swimming pool and tennis court, and a public beach within walking distance. Right out our back door is a boat dock located on a deep-water canal, which is just one canal over from the boat launch. The living quarters feature 3 bedrooms, 2 baths (master has a Jacuzzi tub and separate shower), family room, laundry room, fully equipped kitchen and screened-in porch. The family room is a large, open area furnished with a fully stocked entertainment center (42' TV, VCR, DVD, 300 Disc CD), comfortable den furniture, pool table and bar area. The dining area is surrounded by sliding glass doors and windows, offering a beautiful view of the canal. Kick back on the screened-in porch and enjoy our laid back paradise! Fishing: For the fisherman, the fishing is as good as it gets and there is an assortment of USCG licensed captains that will be more than willing to book a charter and take you out into the bay for a fishing experience that you will never forget. We have year round fishing, with different species here at different times. Trout and redfish are the most sought after fish and can be caught all year long. Tarpon are here from June till August, and cobia will show up in the early spring as the water warms and will stay until fall. Other fish that may be caught on the flats are Spanish Mackerel, blue fish, sheepshead, flounder, ladyfish and a numerous variety of sharks to 250 pounds. Many prefer to head out for deeper waters to catch grouper and snapper. Tennis: For the tennis buff, there are 6 lighted tennis courts across the street from the golf course at Wakulla High School on Hwy. 98 in Medart. Paradise Village also has a tennis court. Biking: Tallahassee-St. Marks Historic Railroad State Trail stretches about 20.5 miles from Tallahassee south to St. Marks. Longleaf pine and forests of oak, wax myrtle and yaupon holly nicely shade the route. The trail is wide and smooth, with occasional restrooms and benches along the rural stretches. Hiking: There are many nature trails to choose from, along with some paved trails. St. Marks National Wildlife Refuge and all of the state parks have hiking trails. Be sure to take bug spray, unless you are hiking in the wintertime. Nearby state parks include Wakulla Springs, Bald Point, San Marcos de Apalache, and Ochlockonee River. Birding & Wildlife: If you have come looking for the call of the wild, then you come to the right place. With vast acres of undeveloped lands and protected wildlife sanctuaries, our natural areas support an unbelievable abundance of wildlife with verified counts of over 300 species of migratory and nesting birds; 52 species of mammals such as the West Indian manatee and Florida black bear; 40 species of amphibians, and 65 species of reptiles. Windsurfing: Shell Point is also great place for windsurfing and hosts several Regattas each year. Restaurants: For those who enjoy great seafood, Angelo's in Panacea (20 minutes away) is one of the finest renowned seafood restaurants anywhere - located right on the water. Nearby Spring Creek Restaurant (less than 10 minutes away) also boasts delicious seafood, including soft shell crab, along with a casual down-home atmosphere. Mad Anthony’s Waterfront Grille located on Dickerson Bay at the Rock Landing Marina in Panacea, FL offers some unique seafood dishes, craft beers, with tiki bar dining by the bay. Riverside Café in St. Marks and Ouzts Too in Newport have great food and often have weekend live entertainment. There are many other wonderful restaurants in our area. If you decide to rent with us, we will send you a list of all of the nearby restaurants, along with our personal rating on each one. Wakulla Springs (10 miles away): Wakulla Springs State Park, one of the largest fresh water springs in the world, is only 10 minutes away. Wakulla Springs was the site for filming the early Tarzan movies, The Creature from the Black Lagoon, and Airport 77. From the river boat and glass bottom boat tours, you can see alligators, many species of water fowl, fish, turtles, snakes, and deer, in and among the crystal clear waters emerging from the depth of the springs. They also have a swimming area, with a diving platform. Kids love it and you will, too. The water stays the same temperature all year round. It's very refreshing in the heat of the summertime. Lighthouses & St. Marks National Wildlife Refuge: The St. Marks National Wildlife Refuge (15 minutes away), which features the St. Marks Lighthouse, offers a habitat for all kinds of Florida wildlife. Keep your eyes peeled for bald eagles. There are 3 other lighthouses along our Forgotten Coast --- Crooked River Lighthouse in Carrabelle, St. George Island Lighthouse on St. George Island and Cape San Blas Lighthouse in Port St. Joe. Beaches: For the beach enthusiast, nearby beaches include St. Joseph's Peninsula State Park and St. George's Island, which are regularly voted into the top ten beaches in the world (an hour to an hour and a half drive). Shell Point Beach is about 1/2 block from Dock of the Bay. It is a very, very small beach located on the bay, which means that the only waves that you will see will be on a very windy day. It doesn't compare to the other two beaches mentioned earlier, but it is very convenient and a great place to kick back and enjoy the abundant wildlife in and surrounding the bay, along with breathtaking sunsets. Other nearby beaches include Mashes Sands Beach (which has a fishing pier), Alligator Point Beach (25 miles) and Carrabelle Beach (40 miles). Gulf Specimen Marine Lab: For a close-up, hands-on examination of marine life, check out Gulf Specimen Marine Lab in Panacea, which is 20 minutes away. Tallahassee Museum: The Tallahassee Museum of History and Natural Science is about 30 minutes away, and offers a look at Florida’s wildlife in a natural setting. Maclay Gardens: Maclay Gardens is located on Thomasville Road in Tallahassee (40 miles away). A masterpiece of floral architecture, the gardens feature a picturesque brick walkway, a secret garden, a reflection pool, a walled garden and hundreds of camellias and azaleas. Tallahassee & Shopping: Only 30 minutes from Shell Point, Tallahassee has all of the conveniences of a big city – malls restaurants, museums, parks, airport – and is well known for being the home of Florida State University (FSU) and Florida A&M University (FAMU). Other, more unique shopping can be found at Apalachicola, which is about an hour drive. We love having the boat dock just out our back door, so that we can be on the bay fishing in just minutes. Dock of the Bay is also very close to Shell Point Beach and close to the community pool. Easy walk to either. Canal front, 1/2 block from Shell Point Beach on Apalachee Bay. We are located on a deepwater canal, about 1/2 block from Shell Point Beach, which is a very small beach on the Apalachee Bay. Handicap ramp is steep, but is OK if wheelchair is pushed by someone else. The living quarters feature 3 bedrooms, 2 baths (one with a Jacuzzi tub), a large family area with pool table and big screen TV, laundry room, screened porch, and fully equipped kitchen. These accommodations will sleep 8 people comfortably, and consist of a king size bed, queen size bed, 2 twin beds, queen sleeper sofa, and a roll away bed. Perfect for a family or a few guys who just want to fish. Shell Point is a small, quiet community located in Wakulla County, one of Florida's best-kept secrets and part of Florida's forgotten coast. Besides offering the best flats fishing anywhere, it's ideal for sightseeing and photography. It is located between St. Marks and Panacea, and is only 30 miles south of Tallahassee (Florida's capital). Tallahassee has all of the conveniences of a big city - malls, restaurants, museums, parks, airport - and is well known for being the home of Florida State University (FSU) and Florida A&M University (FAMU). If you are interested in fishing (trout, Spanish mackerel, redfish, tarpon, cobia, flounder, grouper, black bass ... it's saltwater fishing, so the list goes on), boating, or ... if you just want to escape to a relaxing, laid back paradise; yet, be able to venture into the city on a whim, this is the perfect location for you.